pARTy/SCIENCE raises events and creates experiences. Whether online, realtime, rehearsed or improvised; we strategize directions, develop scenarios, plan productions, produce media, and in general take care of the details, so that you can get your story across in a clear and direct way. Your products, your services, your personnel, your ideas, your innovations - these are all elements of your story. The challenge is to orchestrate and present them in a unique and compelling way. Why do some stories confuse, while others illuminate? Why are some messages instantly forgotten, while others resonate long afterwards. What's the difference? What makes for a good story? What is the secret behind a good show? Once you step into the spotlight, the moment is yours. You can address the obvious, or you can do something more. You have the potential to become an agent of the unexpected. 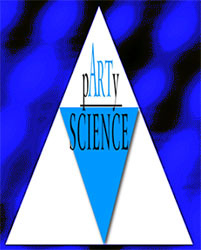 pARTy/SCIENCE has the resources and experience to help you do that. When it's time for your story to go public, then like it or not, you have entered the realm of show business.